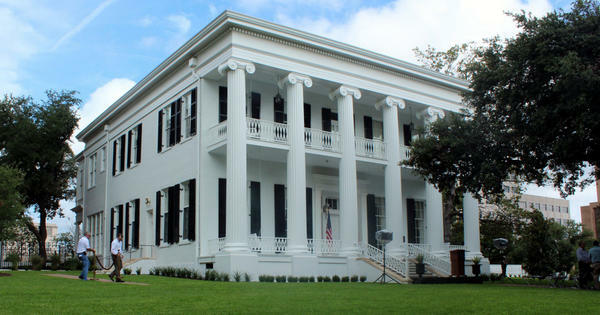 The Texas Governor's Mansion in 2012, restored after a 2008 fire ruled arson. Its next inhabitant inherits a vastly different landscape than that of Gov. Rick Perry. 1876. It was a time of rebirth in Texas. Or maybe more precisely – time to get rid of those Reconstruction-era carpetbaggers. "When the North sent folks down to Texas to govern as governors, Texans felt like these king-like people came down from the North and ran roughshod," says Sherri Greenberg, a clinical professor with the LBJ School of Public Affairs. "So when Texans wrote the Texas Constitution, this very populist document with as much power as possible vested in the people and at the lowest, most local level of government." UT Law Professor Hugh Brady says decentralizing government power was a broader trend across the country in the 1800s. "Now the Constitution says the governor is the chief executive officer of the state of Texas, but what does that mean?" he says. "And for over 100 years, it meant very little." Calling the Texas Legislature into special session: "When there's a need for a special session," Heflin says, "the governor has the responsibility of calling that and setting the agenda." Finalizing a budget: "The strength of the governor … when it comes to the budget is that there's line-item veto power," he says. That veto threat means lawmakers can't get a budget past the governor that he or she doesn't support, "because the governor can veto large chunks of it, and then call a special session to have [legislators] write it all over." Appointment power: "Many of the powers of the governor … come from the responsibility of appointing many, many positions within state government, within [state] agencies," Heflin says. And that appointment power is how former Gov. Rick Perry transformed the office from weak to strong. Even after a 1972 constitutional amendment lengthened the governor's term to four years, that still meant any governor would have to serve at least two terms just to appoint enough people to start gaining controlling percentages of various state boards. But stay in office more than 14 years, like Perry did, and eventually, you’ve made every single appointment to every single board. That meant, when Perry left office, he took much of that power with him. Current Gov. Greg Abbott has begun to make a dent in those Perry appointments during his time in office. But so far he's had a more limited role in the legislative process.